I developed my passion for cooking by growing up in the kitchen with my Mamita whom I must proudly say, is one of those fabled grandma cooks with personal recipes that our enitre family cherishes and will pass down to many generations. In fact when she cooks, friends and relatives can't help but flock to our home for dinner, she is that good. 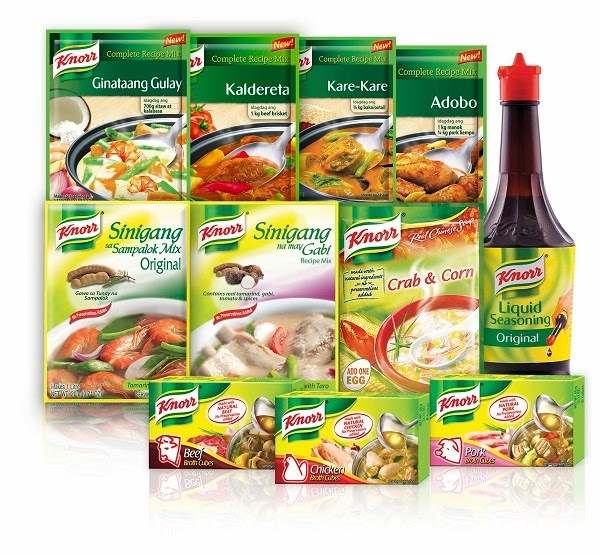 Aside from the overflowing love and dedication she pours into every dish, there is also Knorr. Knorr seasoning, broth cubes and sinigang have been staples in our kitchen for as far back as I can remember. Years after when I was completing my OJT for culinary school in an Italian restaurant, I was surprised to find out that most of their dishes also utilized Knorr chicken powder. I can't blame them since it tastes just like the real thing and cuts back so much on cooking time. It is this longstanding personal relationship with Knorr that made me jumpt at the chance for an afternoon of cooking with Knorr's latest products at The Cookery in BGC with Sari Jorge of 25 Mushrooms fame presiding over the event. The small gathering of "bloggers who cook" was organized to kick-off Knorr's Kitchenhood Movement. The Kitchenhood Movement is their latest effort to encourage women to bring the passion back into the Kitchen by exploring new possibilities with Knorr. There is nothing wrong with all-time favorites such as adobo, menudo and afritada but preparing these weekly for your family not only becomes redundant for yourself but their palettes as well. It is certainly nice to shake things up a bit and introduce something new to the weekly menu. And that is exactly what we did with Sari Jorge and Knorr's Complete Recipe Mixes, Liquid Seasoning and Broth Cubes. Who knew you could use their Afritada Mix to create an excellent Chicken Parmigiana dish in under 20 minutes? I never would've dreamt it but me and Paul actually accomplished that to perfection during the clinic as you can see in the photo above (bilib lang sa sarili :P, but in all honesty, we were truly amazed not just with ourselves but with our final product as well). It doesn't end there. You can also create a fun, DIY Fajita dinner for your family to enjoy in just minutes with Knorr's Complete Recipe Adobo Mix. Having a friendly gathering at your home? How about some Buffalo Wings using Knorr's Sweet and Sour Mix. Seemingly inpossible to achieve at home Paella Negras, Mushroom Cannelloni's and Indonesian Chicken Satay with Nasi Goreng is also made simple and quick with the help of Knorr. Taste these wonders for yourself as Knorr teams up with the World Food Program (WFP) and Mercato Centrale for a unique food fair this October 19, 2013 at BGC to celebrate their 175th anniversary. 50 participating concessionaires will be creating their own dishes using Knorr that you can get to sample for FREE. And as thanksgiving, total proceeds from ticket sales will be matched by Knorr and donated to the World Food Program. If you'd like to try incorporating these new dishes into your household's weekly menu rotation, stay tuned as I will be sharing all of these recipes + their step by step process in the coming days.